This building features an interesting double-shot of 19th century enterprise. 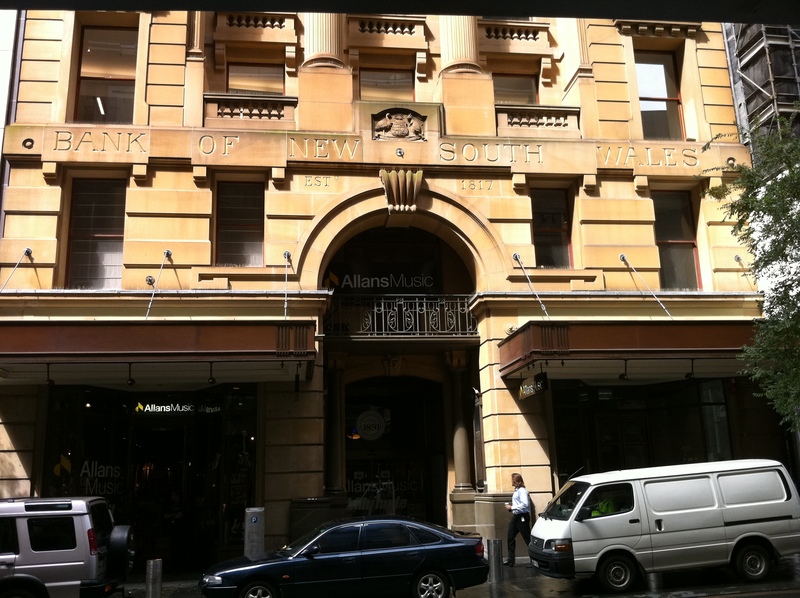 First we have the Bank of New South Wales, established in 1817, making it Australia’s oldest operating company. “But wait,” I hear you saying. “It’s not around today. How could it possibly be Australia’s oldest company?” I’m glad you asked. Between 1850 and 1910, the bank established branches around the country, and also in Fiji and Papua New Guinea (despite Bank of NSW meaning jack to people over there). From 1927 the bank went on a mad spree of acquisitions, buying out the Western Australian Bank and the Australian Bank of Commerce and culminating in a merger with the Commercial Bank of Australia in 1982 giving rise to Westpac. And thus…evil is born. On the other side, we have Allans Music, which I was surprised to learn was established in Melbourne in 1850. Allans by the turn of the 20th century was the biggest music retailer in the southern hemisphere (but where was the competition?). In the 70s, Brashs decided it wanted a piece of the Allans action and acquired the company. When Brashs went under in the late 90s, Allans emerged unscathed and under new ownership. It merged with Billy Hyde Music in 2010 to become a kind of super music conglomerate, the sort that’ll be feeding us through tubes and stealing our vitality 200 years from now. Incidentally, the building to the right of Allans was the Greater Union Pitt Centre, and beside that lived a Brashs for many years. Even the Greater Union became a cut-price CD shop for a time after its closure, and the Galeries Victoria’s JB Hifi sits across the street. This section of Pitt Street has never managed to shake its musical heritage. And oddly enough the site where greater union was is now becoming the evil empire headquarters for ANZ and free hills (corporate lawyers) !